Free from fragrance, colouring and SLS. Epaderm Cream is an award winning emollient cream. 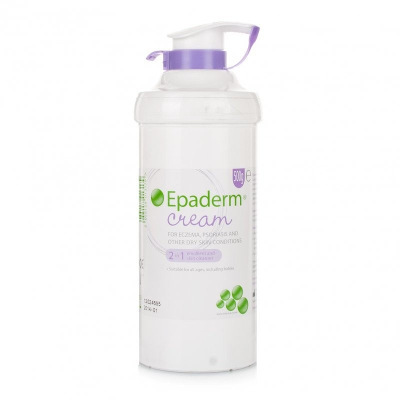 It’s a 2-in-1 treatment for dry skin conditions, such as eczema and psoriasis, meaning Epaderm Cream can be used directly on the skin or as a skin cleanser. Epaderm Cream’s light, non-greasy formulation is suitable for less severely affected areas and daytime use. Epaderm Cream is clinically proven to effectively relieve the symptoms of dry skin, including hydration and smoothness, after just two weeks. Suitable for sensitive skin, Epaderm Cream is free from fragrance, colouring and SLS.